Easter is a magical time at our house. It has the same religious significance to us as Christmas, but without all the crazy commercialism to go along with it. It’s a chance for our family to do some much needed reflection, and it’s also a wonderful opportunity to do some extra fun things together. I love baking with kids. Just like Christmas, one of the big traditions with Easter is the dinner. At our house, Easter dinner is ham or lamb and potatoes (there will also be vegetables, but veggies aren’t typically the stars of the show!). There also obviously needs to be a dessert, but as with any big meal, everyone is usually stuffed full at the end of Easter dinner. 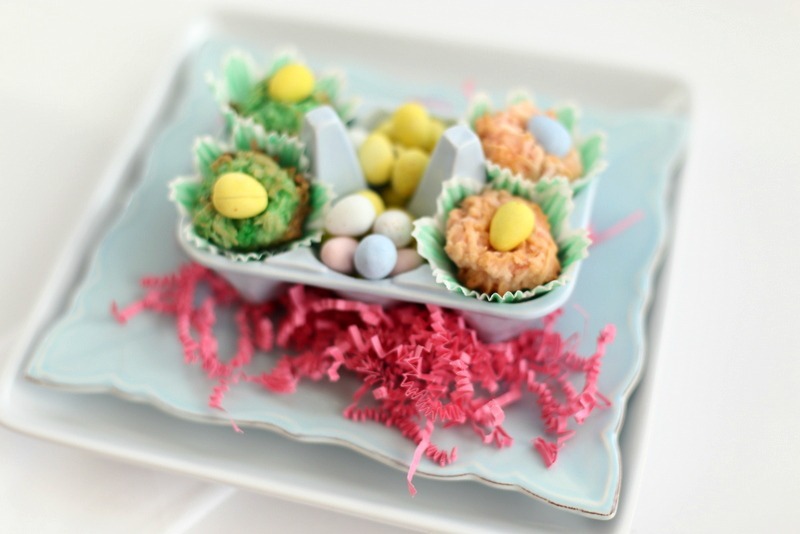 Today, we’re sharing an easy Easter dessert that is not only delicious, but also simple and not too filling. 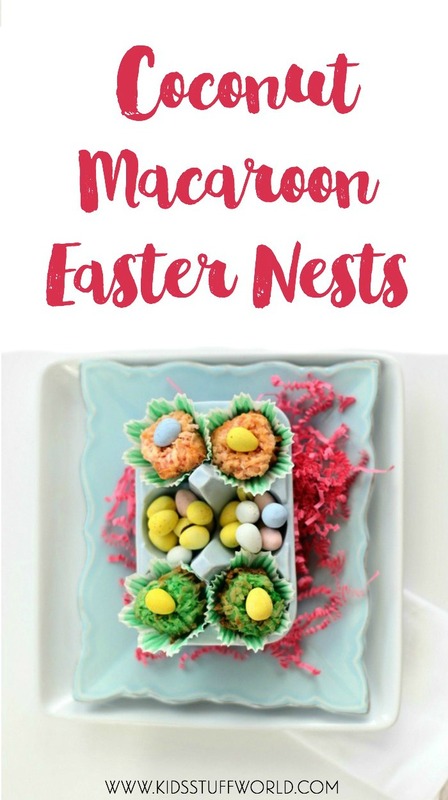 It would also be the perfect thing to bring to your neighborhood egg hunt! 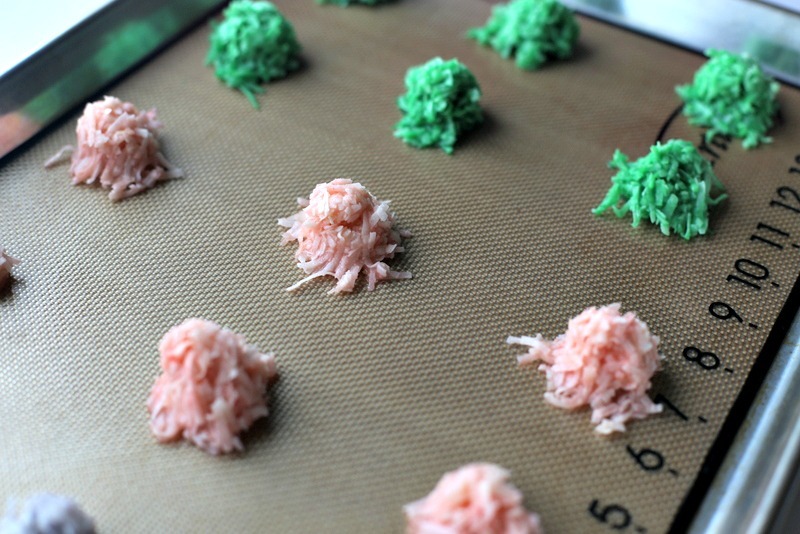 This coconut macaroon recipe has plenty of steps that are perfect for little hands. 1. Combine all ingredients except for the mini eggs and mix well. 2. Using a mini cookie scoop, drop dough onto a lined cookie sheet. 3. Bake at 350 degrees for about 18 mins. 4. 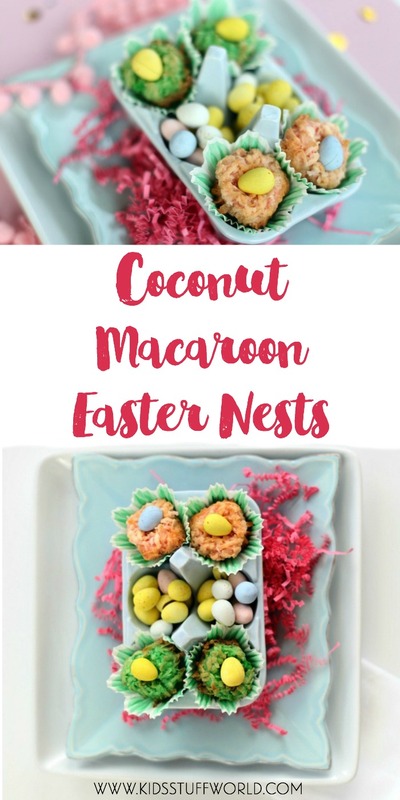 As soon as the coconut macaroon nests are out of the oven press a chocolate egg onto the top of each one. Sarah says, It’s pretty much impossible to mess up macaroons, so you don’t need to worry about over beating or getting the portions completely leveled off. The biggest thing is making sure there aren’t any yolks in the egg whites. Tip: The cookies will still be hot when you add the eggs, so this would be better for adults, but having kids count out the eggs is a great job for little fingers. 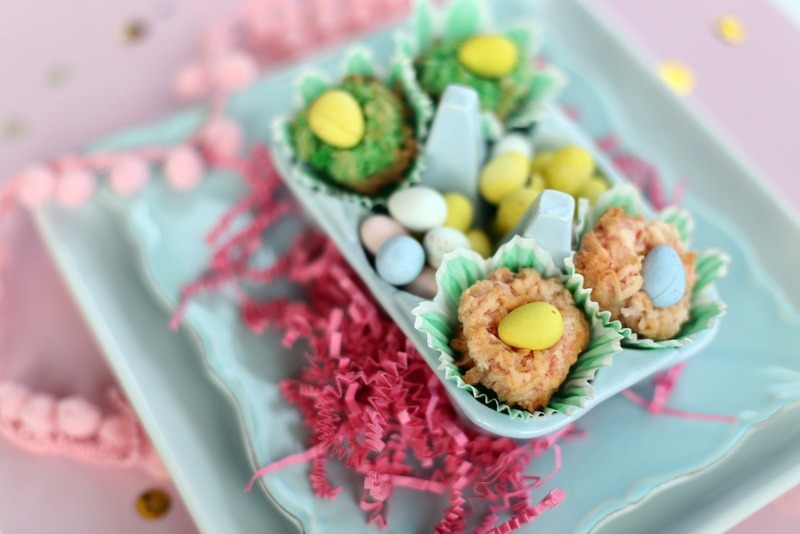 The food coloring is completely optional, but I think it gives these macaroon nests a little Spring in their steps! Want more great recipe ideas and tips for large families? Check out Sarah’s blog Frankly Entertaining … those rose water meringues sound like heaven! Sarah is the mom to six young kids, and last year they decided to embark on the adventure of a lifetime moving to Alaska for her husband’s work (as if six kids wasn’t enough adventure!). I was raised in a food loving family in Nova Scotia, and my first job was in my family’s restaurant. From there I moved on to food and beverage at Disney World and then for a local hotel. My love language is food, and my goal is to show people that preparing delicious food doesn’t have to be intimidating. Find me over at Frankly Entertaining and let's chat!